Bamboo fence panels are easy to install and can be used to visually divide your garden into difference areas, as well as being usefull for transforming yards and creating privacy. Black bamboo fencing creates a contemporary look in your outdoor space that provides ultimate privacy while still maintaining style and beauty. It is constructed from bamboo that is naturally black, free from excess stains or dyes. 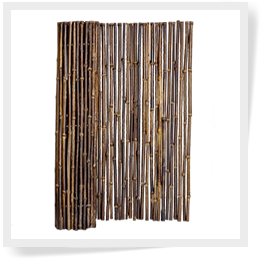 Bamboo is widely used in the world in flooring, art projects, space dividers and especially as fencing. Black bamboo fencing in particular is very unique as it is very eco-friendly and inexpensive compared to other wood fencing options. Installing black bamboo fencing in your home landscaping can add an extra element of luxury and give your yard that contemporary vibe you’ve been looking for. 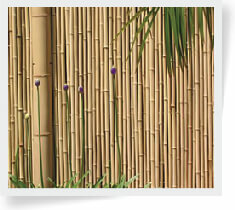 You can use bamboo fencing as a great privacy separator between you and your neighbors. You can also use is to create a pool surround, create garden edging, gazebo siding and more. If we all purchased and used traditional wood fencing, this could lead to rapid deforestation. If we choose to use bamboo instead, it is a much more environmentally friendly option, as bamboo is a natural resource that grows back extremely fast and is easy to harvest. You can create your own beautiful backyard DIY oasis by installing this unique eco-friendly material. Bamboo is naturally beautiful and has the ability to transform your home and add a distinctive tropical feel to wherever you look. Black bamboo fencing complements a variety of design styles and décor and is ideal for any indoor or outdoor project. Black bamboo fencing can be implemented into many of your projects. Sizes include: 1" X 3' X 8’, 1" X 4' X 8’, 1" X 6' X 8', and 1" X 8' X 8'. Black bamboo fencing offers ultimate privacy in your backyard because of its dark color. Start protecting your home today with our top of the line products standard with free shipping.